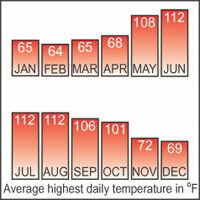 In the desert areas the temperature fluctuates significantly, particularly during summer. In summer the temperature may vary from 6 °C at night, to 41 °C during the day. In the winter season, the temperature remains more or less stable both during the day and night. During the night the temperature, at time drops down to 0 °C and during the day it could reach 18 °C. Egypt is a pan continental country which has variable climatic condition, which prevails all round the year. For instance,Egypt receives an average annual precipitation of almost eighty one millimeters or even lesser than that, however, the coastal areas, due to their geographical position receives much more rainfall.